The little ladies are really engaged in imaginative role play at the moment. Led by Miss Boo they will play for a good hour playing mums and dads or more recently, vets. They take their cuddly dogs for a walk around the house, brush them and take them for a check up. 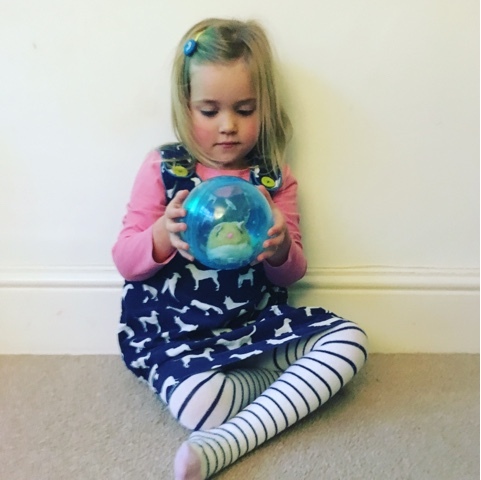 They would love a dog but with 3 children under 5 I feel I have enough to manage at the moment so for now they will have to make do with make believe. They were thrilled when these interactive pets from The Entertainer arrived. When I asked the little ladies which one was their favourite they said "all of them"and they couldn't wait to get them out the box and play with them. They would all make such lovely gifts for little animal lovers this Christmas. 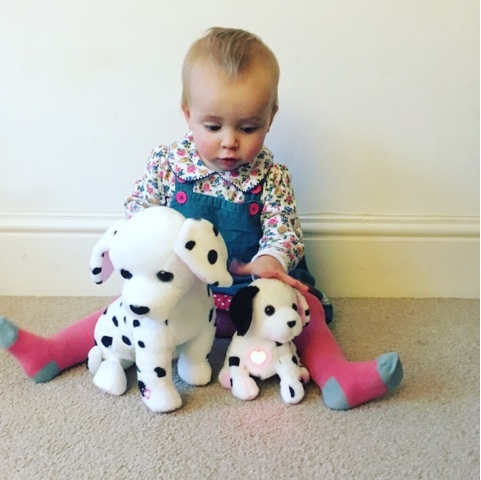 We really love these interactive Ruby and Lottie dogs from Animagic. They come as a mum and pup pair. 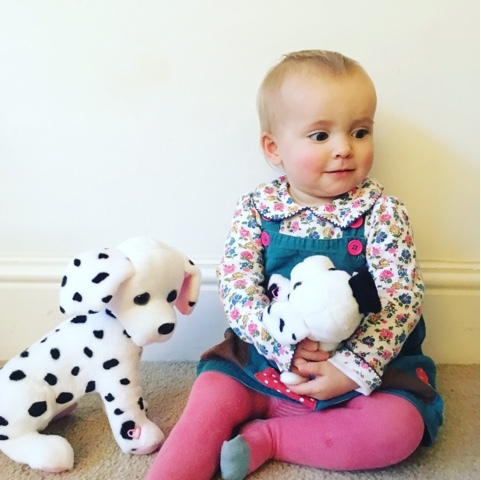 The little ladies decided that they puppy would be called Lottie as Miss Dot is actually called Lottie. When you stroke their backs they wake up and bark and pant which the girls thought was brilliant. Their hearts glow pink when they are happy and together and blue when they are apart and sad. You simply match the stitched hearts on their feet together for them to glow pink and separate them which turns them blue. The girls really emotionally engaged with this and did all they could to keep their new dogs happy. They have been to 'the vets' and led around the house on a bit of ribbon and shared lots of cuddles. They are really lovely and soft, the girls have really warmed to them and wanted to take them to bed. Rather wonderfully there is a hidden off button to stop them barking and crying and if they are unplayed with for 30 seconds then they automatically go into 'sleep' mode. They take 3AAA batteries which were included which is always a plus on Christmas morning meaning they can be played with straight out the box. 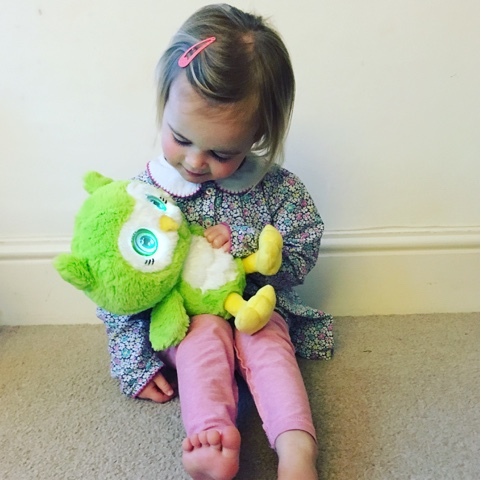 There are 4 different pets to collect, Rosy the cat, Twinkle the puppy, Tiny the elephant and Breeze the owl. 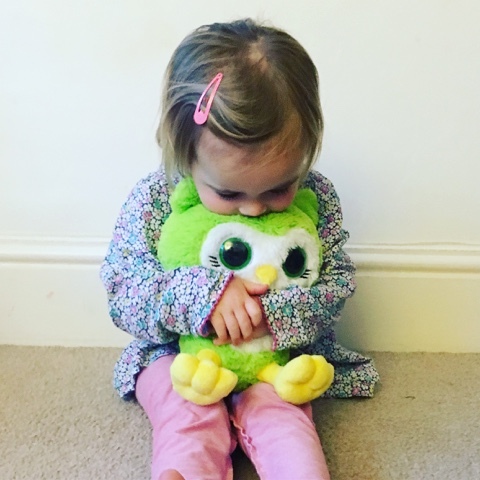 We are the proud owners of a pet owl and the little ladies are absolutely amazed by it. 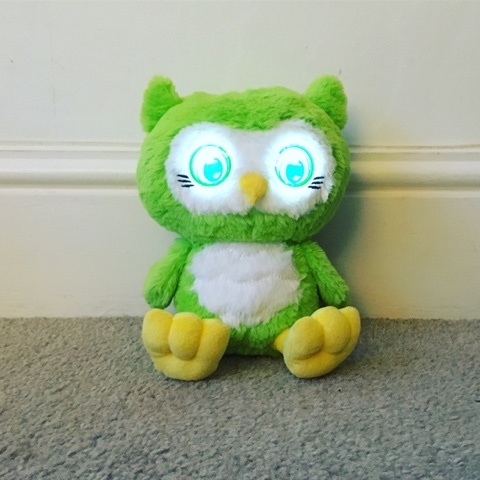 His eyes light up and it makes super cute twit -twoo sounds. Interaction through touch brings the pet to life, you simply pat it on the head and it's eyes animate and blink as he snores and giggles. The eyes are very realistic and the girls really enjoy interacting with it. It has a mute button for silent bedtime play, where his eyes light up but without sounds making him a lovely bedtime pal. He comes with 3 AAA batteries so he's ready to play with as soon as he's out the box. And he's also very cuddly! You can't help but find this toy cute. It encourages nurture, imagination, and movement as he scoots around in his little exercise ball. He can run around with or without his ball just by switching him on with the switch on his tummy. The girls thought it was so funny watching him scuttle around. He moves in a very life like way and when he bumps into things he changes direction. We have called him 'Samuel'. 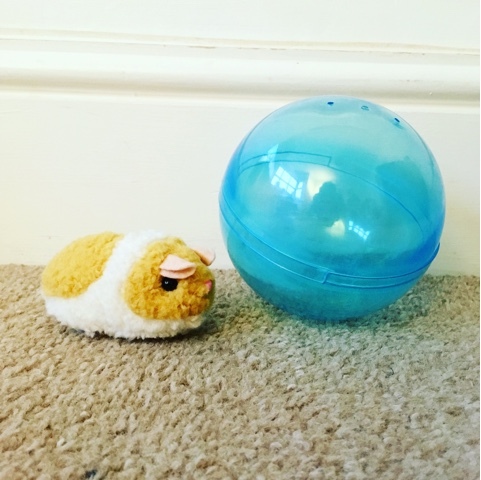 Samuel brings us all the joy of having a hamster but without the hutch to clean out. He's really lovely and would make a fantastic stocking filler or birthday party gift. He requires 1 x AAA battery which isn't included so make sure you have one in stock. The little ladies absolutely love their new pets and have played with them for hours. Being interactive they have so much play value and really spark their imaginations. 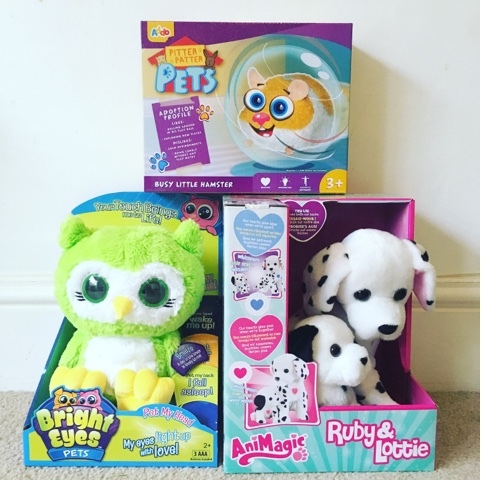 The Entertainer have so many wonderful toys in their collection and at fantastic prices. I'd really recommend taking a peek at their website as they have lots of fab deals on at the moment to help you with your Christmas shopping. 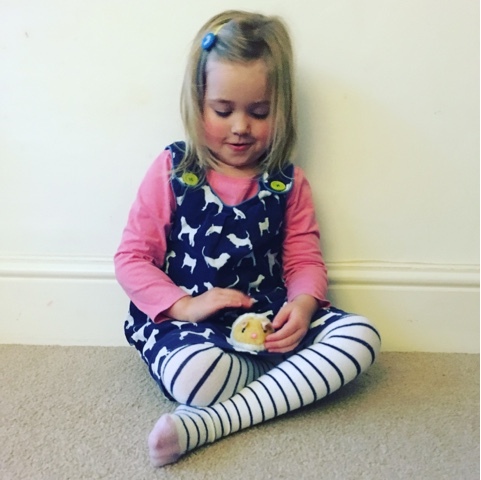 I hope this post has given you some inspiration if you are stuck for ideas for your little ones.